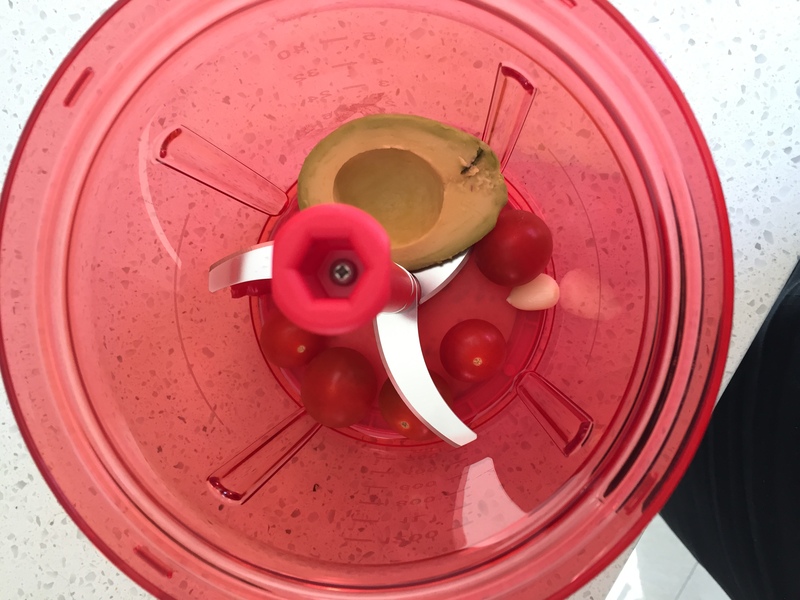 I can’t believe that I have made it this far through life without owning a blender! All those hours I have wasted in the kitchen slaving over a hot knife, vegetables and chopping board, that could have been spent doing something productive – like pouring drinks…! AND it is going to be absolutely awesome on the boat because it requires no power! My life has been changed today…! So I tracked down the local Tupperware supplier, managed to wheedle my way out of hosting a Tupperware party in fear of all my friends dis-owning me, and handed over my credit card details, waiting in anticipation all day for the last week with my nose pressed against the office window waiting for my ‘local demonstrator’ to come and deliver my new gadget. Today it arrived! I diligently brought it home, unwrapped it and read the instructions (which are conveniently also given in about 200 different languages) and decided that I must find something urgently to chop up! 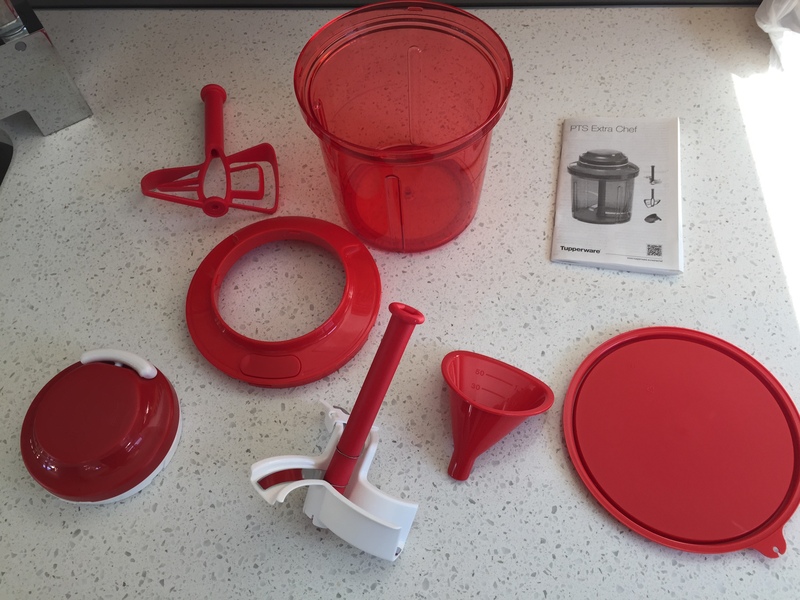 So here is what you get when you unwrap your parcel – the main container with a nice silicone non-slip base and handy measuring lines on the side, a lid for the container if you decide to use it as just a container or measuring cup, the sharp blade for slicing and dicing things up, the beater blade – for beating up cream, eggs etc I imagine, a little funnel with a measurer for if you want to add liquid things in during the blending process without taking the lid off and covering your ceiling in blended food, and the special lid with the magic drawstring that powers the blade. 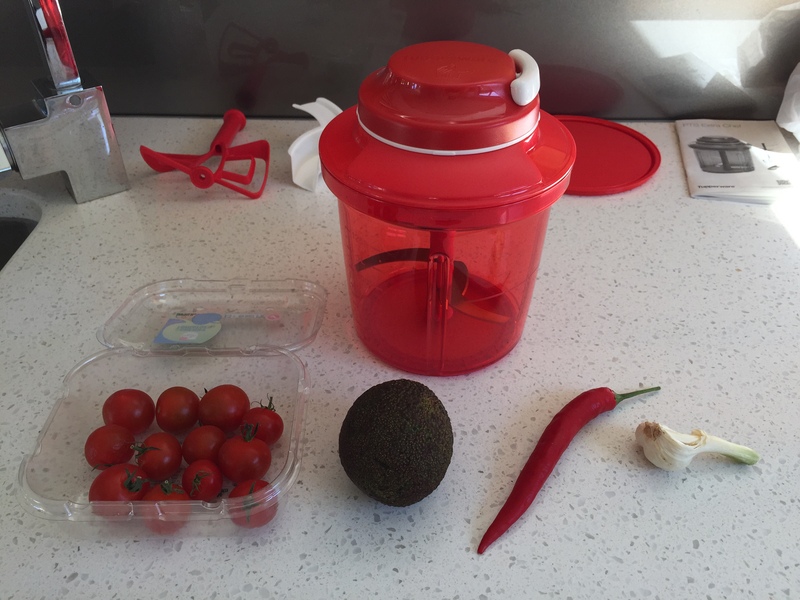 I merely removed the stalks from the tomatoes, unwrapped the avocado from its shell, took the seeds out of the chilli and removed the skin from the garlic and chucked it all in! This took me about a minute. Next comes the fun bit, and it is quite hard to take a photo of at the same time as pulling it. (one armed people might have a problem operating the Power Chef, as you need one hand to hold it down and the other to pull the cord) The action is just like starting an outboard motor, so all sailors should have no problem with this. A container full of nicely diced up food! You could continue pulling and pulling to obtain a smoother consistency, you know, like you usually have to do when your outboard motor doesn’t start? Sailors muscles should be well developed to operate the Power Chef. You will have no problems there. Next step – EAT and enjoy! It all comes apart for easy washing. 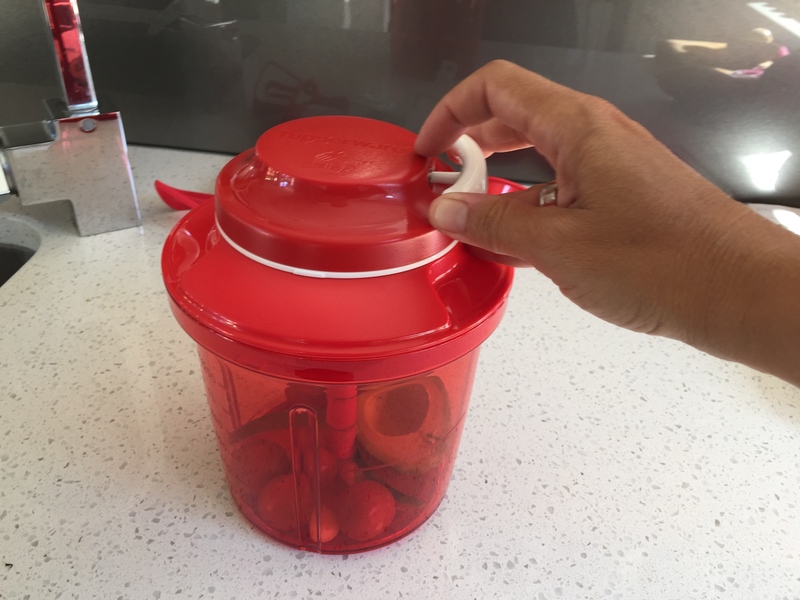 They recommend hand washing the blades to keep them sharp – but you are unlikely to be using a dishwasher on the boat anyway, and if you are then you will probably also have the power capability to run a power operated blender anyway! And the pull cord bit (just like your outboard motor) shouldn’t be submerged in water either. And you know the really cool thing is that it is red and it matches my boat! It was reasonably expensive – about NZD$140.00 ish from memory (haven’t seen the credit card bill as yet!) But it also comes with a lifetime guarantee. (I’m sure I could still find some of those olive green, brown and orange tupperware containers I remember from my childhood somewhere in the back of a cupboard somewhere!) You do have to admit that Tupperware stuff is made well. 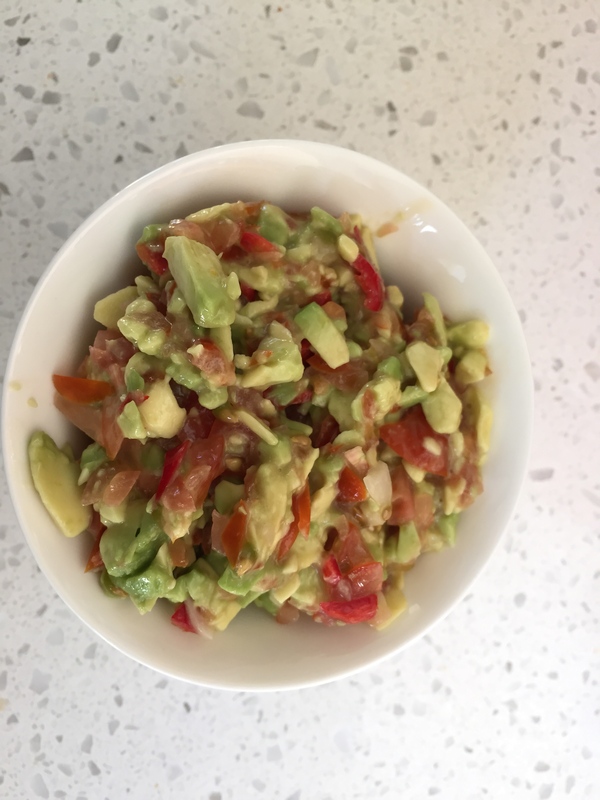 Happy blending and let me know if you have got any other similar special Kelly recipe salsa/guacamole recipes that I can use my Power Chef to blend things up with! Here is the Tupperware YouTube demo in case you need further convincing. Love it! I, too, have just bought a blender and wonder what I’ve been doing with my life, so I can relate! But being on a barge now we have a power one (shock horror) – I love your gadget! That’s brilliant! We have an electric one about the same size aboard Cambria, but the Tupperware Power Chef would be my choice if I needed a replacement. Wow, great product and write-up! I’ll probably have to get one of those. Wow! 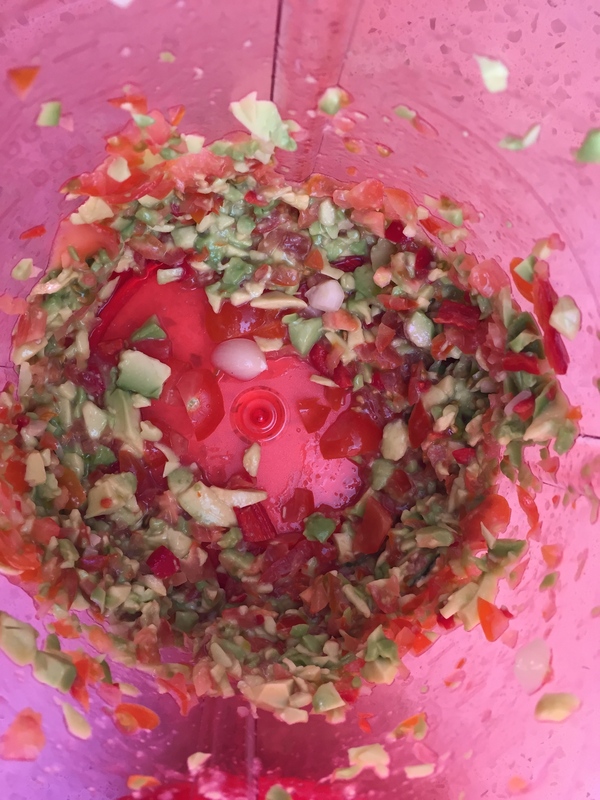 We love guacamole, i should try using our food processor to mix it up next time. I’ve got a hand crank blender already on the boat. But it’s more for blending drinks and cocktails, but we don’t often have any ice to make the drinks with! The one I had already is also quite heavy, glass and you had to find something to clamp it to before you could blend. Okay, cool. I thought of them interchangeably because I use my blender at home as a food processor more than for drinks (I like beer best), but I see the difference, especially for the boat. Yours looks great, very compact and lightweight. So wish I’d seen this BEFORE I bought something similar but takes up 3 times the space! Lol – always the way isn’t it!